At my current customer I use a company supplied laptop. In the office, when I logon I get connected to a Home Folder on a network drive. SoapUI stores it's default workspace in the root of that folder, based on Windows settings. At home I connect using VPN and somehow this Home Folder is unreachable. Very inconvenient, because with every restart I need to open/import my projects again. As with the increase of the heap settings like I showed a few days ago, also for the location of the user-home, there is a property, that can be set as a Java -D argument. On a restart and a subsequent close of SoapUI you'll notice that it writes the workspace in the denoted folder. By the way, I found this tip here. I have some testcases to run a complex of OSB services that processes documents in a content server. 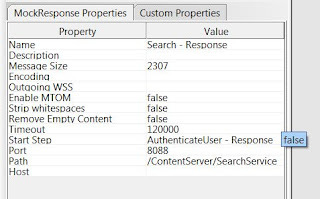 Using a customization file I changed the endpoints of the content server's webservices to mock-services in SoapUI. In these testcases I kick-off the OSB services, and in successive MockResponse-teststeps I try to catch the service-requests of OSB. This enables me to set assertions on the messages that OSB sends out to the content server, and thus validate the messages built in the OSB-proxies. I found that one testcase can run correctly for one time, but running it the second time, or running a second testcase succesively, may fail. Now it is quite important to have the successive MockResponse-teststeps started at the start of the previous teststep. At the failing test step, OSB apparently sends a request that isn't caught by SoapUI or SoapUI responds with a HTTP-500 (Internal Server error). Using JVisualVM, monitored the Heap of the JVM of SoapUI, and I found that just about the time the start/run of the failing teststep, there is an increase in heap. Now, since I found that having the set the Start Step property of each MockResponse-step is important, I figured it seems that timing is everything: also an increase of the Heap consumes time, and is presumably triggered by a major Garbage Collect, that halts the application for a brief moment. So I wanted to increase the amount of heap. Since SoapUI is started with an .exe file (under Windows that is), the JVM properties (SoapUI is a Java application) are stored in a file. Under windows it can be found in "c:\Program Files\SmartBear\SoapUI-5.1.3\bin", depending on the version of SoapUI. You'll need to change the security properties to enable yourself to edit/save it. Then change the -Xms and -Xmx properties according to your needs. The defaults are quite "cautious": -Xms200m and -Xms1000m. Using JVisualVM you can see that with a restart the new memory settings are picked up and in my case that no increase in Heap is needed during the tests. Last july I wrote about setting environment depended properties in SoapUI. 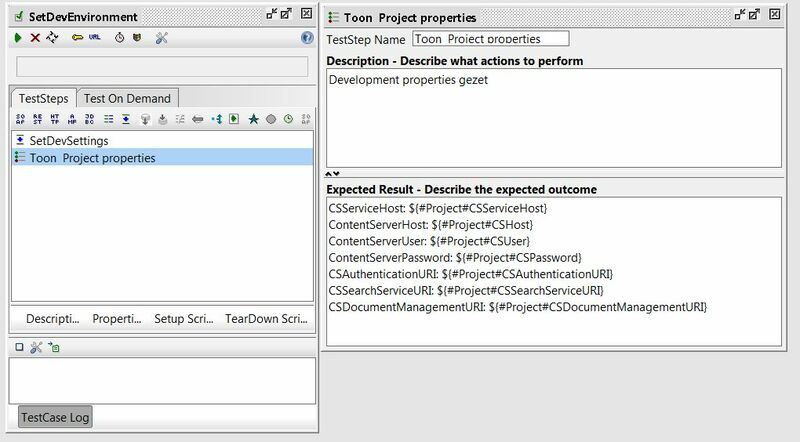 I'm looking for the best way to make SoapUI testcases environment independend and to make it easy to switch between target environments. In that article I suggested to create a set of properties with the actual working values on project level to be refered in the endpoint urls (hostname:port + URI), username/passwords and so on. And per environment a distinct set of the same properties holding the values of that target environment. Then I created a test case per target environment that copies those target-environment values to the working properties. This works fine for me. However, in my quest to the most comfortable way of registering and toggling between those values, I found a few enhancements quite convenient. Don't forget to click 'Ok' after this step. Unfortunately I did not find a way to increase the 'Expected Result" Textarea. The second enhancement was that I moved my Target Environment property values to the "setEnvironment" test case. I found that with an increasing number of properties it is quite hard to have a clear overview of the properties. And I need to think about a proper naming convention. But when I moved those to the "setEnvironment" test case I have a distinctive set of properties per environment and on project level a distinctive set of working properties. Since the testcase is environment-specific, I don't need a target-environment reference in the property-names. And also, they are scoped and thus not referable within other testsuites/testcases, preventing errors. Copy and paste the properties to move (since I did so allready you'll don't find my target-env properties here anymore) to a seperate file to get them together. You'll find at the end of the testcase an empty properties element (<con:properties/>). Open it up (<con:properties> </con:properties> ) and copy and paste the properties within the element. SoapUI doesn't do formatting of the xml, so you might want to add line-feeds like I did in this example. Finally you need to change the property-transfer-lines. In the example above, you'll see that I found the transfer-step and added line-feeds for each "<con:transfers ..."
You'll find in this line the source step: "<con:sourceStep>#Project#</con:sourceStep>" and target step: "<con:targetStep>#Project#</con:targetStep>". 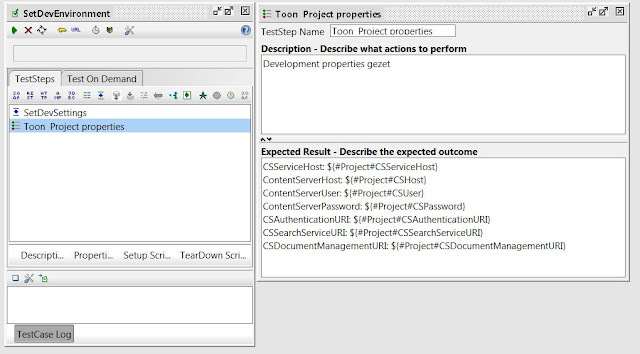 Change the value of the source step to: "<con:sourceStep>#TestCase#</con:sourceStep>". Now the property is refered from the testcase instead of the project. The property on project level can be deleted. 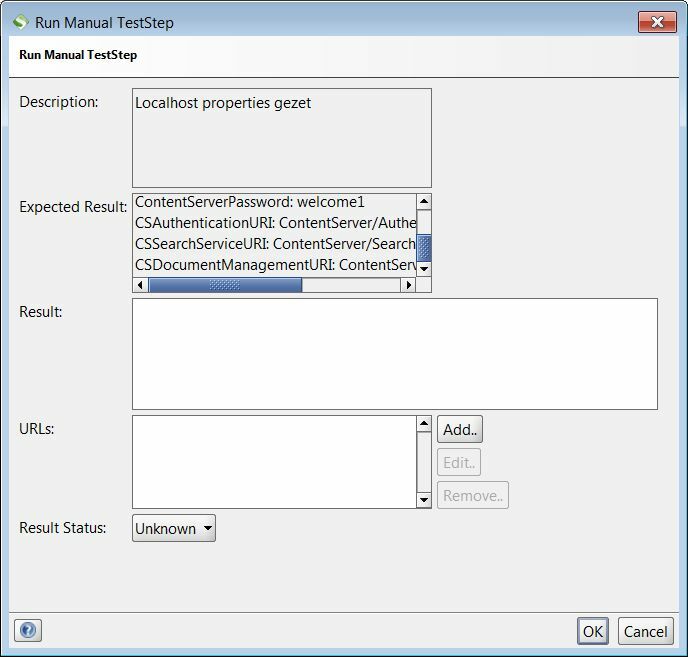 Renaming the properties can better be done from the UI, since SoapUI will then change the property-name also in every reference. Even in soap-requests. So after changing the file in your ascii-editor reload the project in SoapUI. And make the final changes and do the tests. Now, although this is a nice example of source-hacking from outside the UI, you can't expect any support on this of course. So enable a proper version-control and test the SoapUI properly.